A.H. hasn't connected with her friends on Goodreads, yet. She published her debut novel Jorie and the Magic Stones in December 2014. 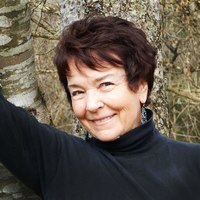 At the request of those who loved the first ‘Jorie’ story, Richardson has written a sequel titled Jorie and the Gold Key, and she is currently working on the third book in the series. In addition to children’s books, she also enjoys writing murder mysteries. She is the author of Murder in Little Shendon, a thriller murder mystery which takes place in a quaint little village in England after World War Two, A. H. Richardson was born in London England and is the daughter of famous pianist and composer Clive Richardson. She studied drama and acting at the London Academy of Music and Dramatic Art. She was an actress, a musician, a painter and sculptor, and now an Author. In addition to children’s books, she also enjoys writing murder mysteries. She is the author of Murder in Little Shendon, a thriller murder mystery which takes place in a quaint little village in England after World War Two, and introduces two sleuths, Sir Victor Hazlitt and his sidekick, Beresford Brandon, a noted Shakespearian actor. And she has more ‘who-dun-its’ with this clever and interesting duo… Act One, Scene One – Murder and Murder at Serenity Farm. A.H. Richardson hasn't written any blog posts yet. "Packed with adventure and imagination, this chapter book takes off into a rich world where friendship, loyalty and trust are key. We’d love your help. Let us know what’s wrong with this preview of Jorie and the Magic Stones by A.H. Richardson.